Brunhilda is a female half-orc fighter who has recently joined a pirate crew. 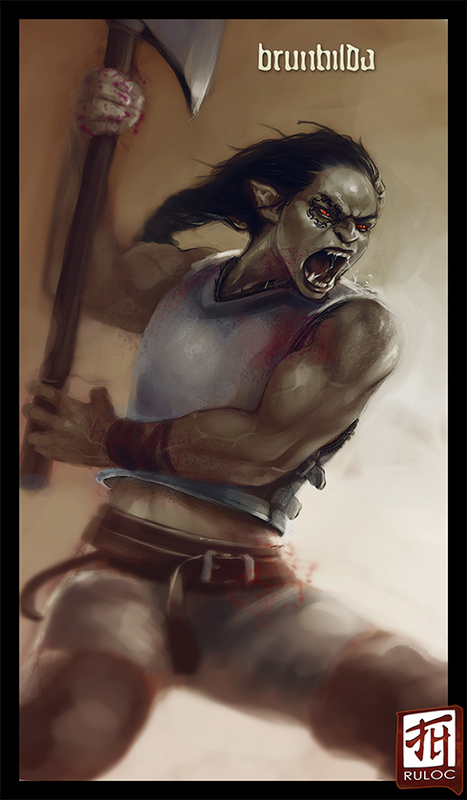 She has a bulky-athletic build and a terrifying roar that can intimidate nearly any foe in battle. She is a dazzlingly skilled combatant who favors a greataxe above all other weapons, which she wields with lightning-fast precision and finesse. Brunhilda is the offspring of a human slave (mother) and a full-orc, born into a Gorum-worshipping orc tribe in Belkzen called the Blazing Eye Tribe. At a young age, her mother escaped, traveling far south to Westcrown with the child in tow. The two lived there for a short time before her mother died tragically, and Brunhilda was thereafter cared for by a beneficent dwarf who taught her how to fight by focusing and controlling her extraordinary strength. She wears a heavy iron breastplate that is stained with blood and salt, and bears a tattoo given to her in her youth: A ring of black flame surrounding her right eye, which symbolizes the burning gaze of Gorum. She carries a longbow in addition to her primary weapon, and prefers to leave her arms bare so that her enemies can be intimidated by the sight of her bulging muscles. Her hair is black, and normally pulled back in a single loose braid, with wild strands coming loose from movement. Her eyes are yellow, and tend to darken to a more orange shade when she's angry.